An almost perfect example of the BADA transfer on the bottom of an 18th century tea bowl – clearly marked for customs purposes only. Can you imagine living in a world where certain decorative items purchased for the home – came with a large sticker announcing – this person has TASTE and MONEY? From the 1950s until some time in the 1970s New Zealand operated just such a system. 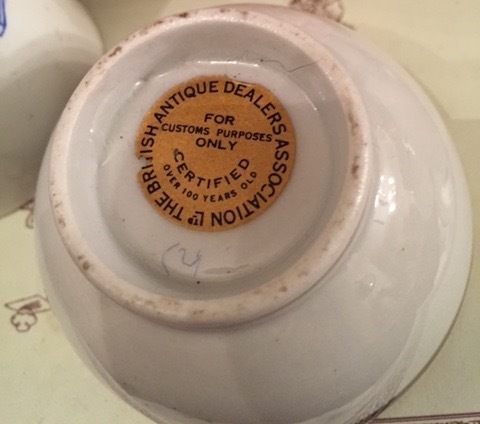 The New Zealand Customs department required antiques imported from Britain to be marked with a symbol to certify that said objects were over 100 years old. This indicated that no duty need be paid on the item but inferred so much more. 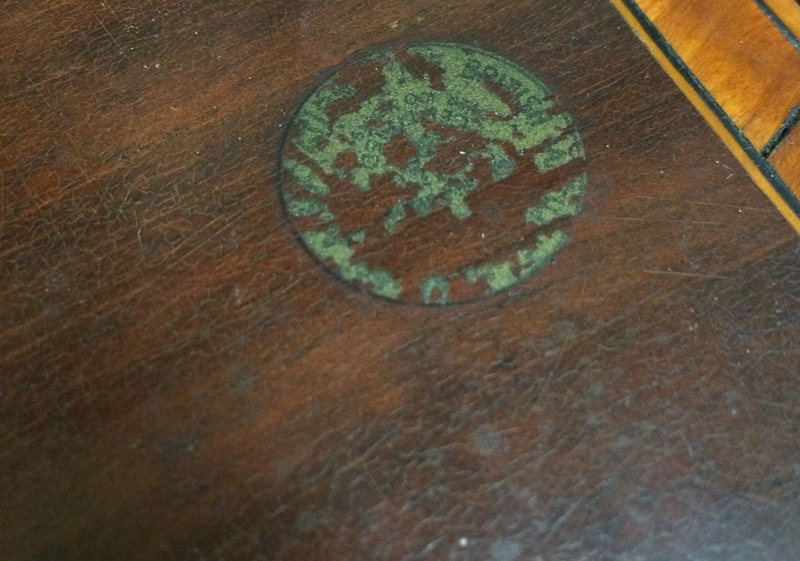 The British Antique Dealers Association (BADA) took up the task with gusto and antique shop juniors back in England were given the job of sticking little adhesive gold medallions onto endless pieces of Georgian and Early Victorian furniture, silver and china destined for New Zealand. I’ve often been fascinated that BADA, who were supposed to know all about the preciousness and delicacy of the items they were selling, were often utterly insensitive in the placement of this mark. I realise now that a more careful placement would have risked missing the gaze of Custom’s officials who would then have been pounced on the item as contraband. In their defence the gentlemen of BADA couldn’t have imagined that New Zealanders would adopt this little circular mark and leave the stickers on permanently. This of course reflected two very New Zealand characteristics – insecurity and snobbishness. Very much still there 50 years later. A BADA Sticker on an Old Sheffield Plate salver. When I recently acquired a pair of Old Sheffield Plate salvers by Matthew Boulton (see ‘Old friends and rivals reunited,’ June 30 2015), I was amused to see a BADA sticker, well-worn, but still in place on the face of one. What to do? Do I preserve this increasingly distant moment of New Zealand social history or return the two salvers to their real status as an identical pair? There is a BADA sticker on a sideboard here, which seems to go further, embalmed with every new coat of wax. Between polishes I tend to forget about it and I smile every time it is rediscovered. So I’ve decided to let that guide my approach. 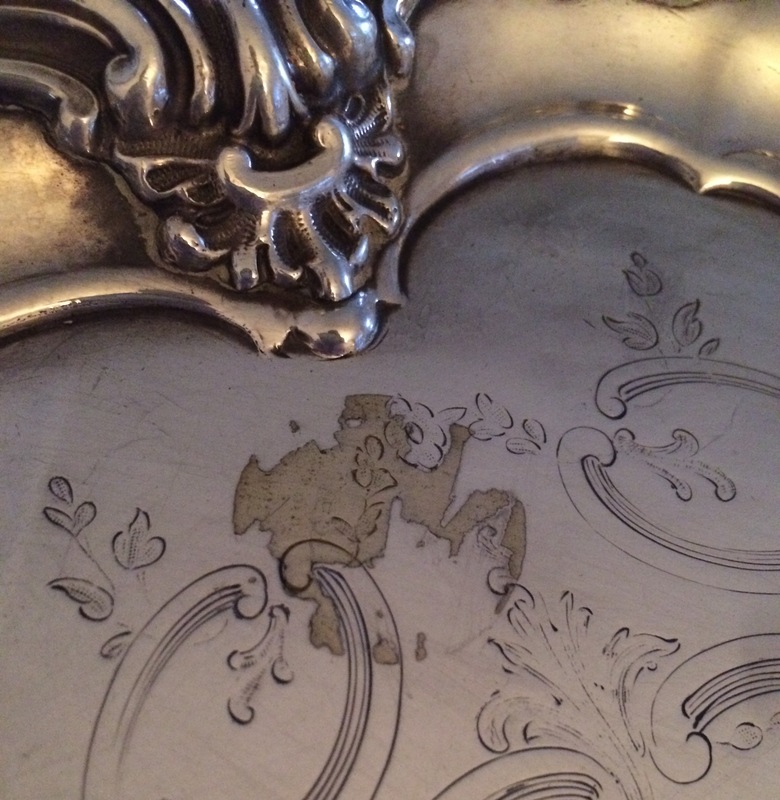 The label on the salver will be removed allowing the pair of salvers to be identical. On the sideboard where the rich gold of the label slowly is slowly melting into the dark mahogany of the sideboard it can stay. I like to think that those New Zealand collectors who had real knowledge and confidence in their purchases removed their BADA labels pronto but how does one now remove an adhesive label? Especially one intended to be temporary but stuck to an item for close to fifty years. Silver or more correctly Old Sheffield Plate is a delicate surface – an abrasive cleaner is going to take off more than the label. I had no desire to wear a large circle of copper in the otherwise intact silver surface around the sticker. I tried a couple of basic household cleaners, designed for glass and other light cleaning duties but the sticker remained stuck. Before turning to more heavy-duty substances I decided to step back and think for a moment about the sticker itself. First came the realisation that this wasn’t in the contemporary sense a sticker at all. When I was a child – about the same period BADA were sticking these labels on – we referred to them as transfers. I knew them best from bicycles and tin bodied train sets. This was confirmed by a quick investigation of techniques for the removals of decals from vintage bicycle frames. Technically they were called water transfers, a form of documentation that was soaked in water and then slid off a paper-backing onto the intended surface – in their case a bicycle frame, in my case an Old Sheffield Plate salver. The best bicycle world advice for removal was to use of a hair dryer to heat the transfer and then a finger nail to scrape it off. I have a hair dryer but a finger nail was an altogether different issue – my nails are currently cut too short to peel much at all. Heating the label I could achieve a degree of scraping that was only partially effective. I could of course just wait a week or two to grown a decent thumbnail but I’m not that patient. Next in the bicycle guide’s line up was nail polish remover, not something that a male with no nails to speak of has at hand. Then it occurred to me that I have an army of cleaners used for the ‘delicate’ surface of my ancient car. How different could the two surfaces be? Still there – BADA as a symbol of British resilience. A compound designed for removing grime from old and delicate painted surfaces had an interesting effect – it polished the BADA transfer returning it to its original glowing gold – but did little in the way of removing it. A cleaning polish did no better. Even a little petrol had no effect (nor did methylated spirits or turpentine). Ever mindful of the silver itself, I could see that each application was removing something of the sticker but just not enough for my liking. In the end I decided to think of that transfer not in terms of the snobbishness of New Zealanders but as a symbol of the famed notion of British resilience and their determination to soldier on. My salver is BADA certified and BADA certified it seems to want to stay. 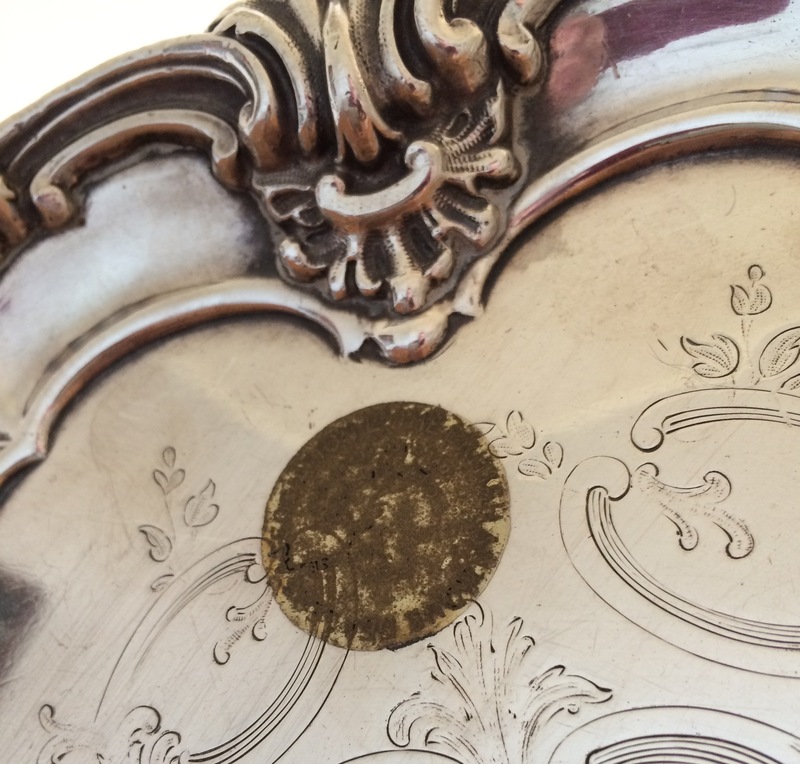 This entry was posted in collecting, original surfaces, practical matters and tagged BADA, British Antique Dealers Association, cleaning silver, Matthew Boulton, NZ Customs, Old Sheffield Plate, sheffield plate, silver. Bookmark the permalink.